The decision to start therapy may well be the most important one you ever make. It could mean the difference between a satisfying, fulfilled, and meaningful life or one characterized by despair, dejection, and defeat. A successful experience in therapy doesn’t just affect one aspect of your life, but transforms every part of it: your a career, relationships, even your leisure time. The unfortunate truth, however, is that many people do not have a successful experience in therapy. You may even know people who have seen a psychologist and tell you it was just a waste of time. Understandably, many people approach therapy with trepidation, anxious not to do anything that will mess it up. As is so often the case, it is by being worried about the wrong things that we bring about the very thing we fear most. Perhaps the best way to approach this question, then, is to start with the things you should not worry about. The first thing not to think about is how to impress your new therapist. Any therapist worth his or her salt, already knows how difficult it is to make the decision to start therapy and become a better person. That’s impressive enough. Your therapist also knows that therapy has to be a judgement-free zone for you to make real change. He or she is not there to give you a rating, but to listen and understand. The next thing you need to try and remove from your minds are feelings of embarrassment, shame, and the justifications and excuses that you produce to cover these up. What your therapist needs above all is information about you: the real, unvarnished truth. The therapist’s office needs to be a place where you feel free to open up and reveal the personality that lies beneath. If things go as they should, you will discover things about yourself that you did not know before, but before that you need to reveal all that you do know. Now we have discussed what not to think about, we look at what should be on your mind. Perhaps the most crucial thing you should be on the lookout for as you embark on therapy is the connection between you and your therapist. The relationship that develops with your therapist is the most important single factor determining how successful therapy will be. A relationship where you feel comfortable, accepted and understood allows your therapist to give you meaningful help and advice and put you in the right position to accept and act upon it. More than that, the therapeutic relationship itself is a source of personal growth, in which you gain the ability to trust, to connect, and to learn new ways of thinking. It’s important, therefore, to have the connection between you and your therapist in mind when you embark on treatment. That doesn’t mean you should set about actively trying to build such a relationship or try to force one where it is absent. As with any other meaningful relationship in life, a fundamental feeling of connection and compatibility needs to be there. If, after a few sessions, you don’t feel like you are forming a bond with your therapist, then share your concerns. A good therapist knows that you won’t make progress without this feeling of connectedness and, if necessary, will be happy to refer you elsewhere. Above all, though, when you start therapy, what should be foremost in your mind is one question: ‘am I ready to heal?’. The process of personal growth is hard work; it can be painful and it is easy to shrink from it. 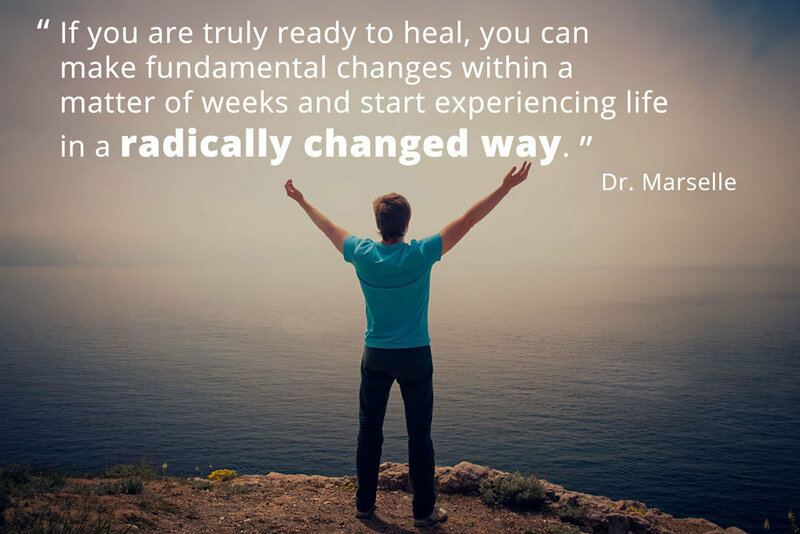 However, the truth is that if you are truly ready to heal, you can make fundamental changes within a matter of weeks and start experiencing life in a radically changed way. Therapy can give you the tools of open minded mindedness and self-awareness that you need to remake your life, but it cannot give you the will to do so. This is an issue I will deal with more in future posts. Dr. Robert Marselle earned his doctorate degree in psychology (Psy.D.) from Ryokan College in Los Angeles and his Masters in Counseling Psychology from La Jolla University. 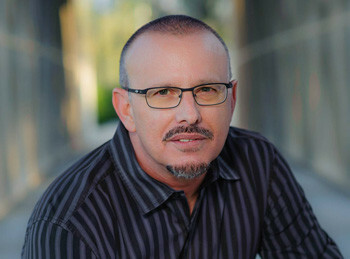 He is a licensed clinical psychologist and a Registered Nurse (RN) in the state of California and is a certified TeleMental Health Provider by the TeleMental Health Institute, TMHI. Would you really rather be happy than right? When a couple is caught up in endless bickering, one of the stock responses of a therapist is to ask, ‘would you rather be right, or be happy?’. The response is supposed to be, and usually is, ‘I’d rather be happy, obviously’. The practical importance of this insight is that the next time you’re stuck in an argument with no end in sight, you simply withdraw. You give up your insistence on being correct and instead choose happiness. 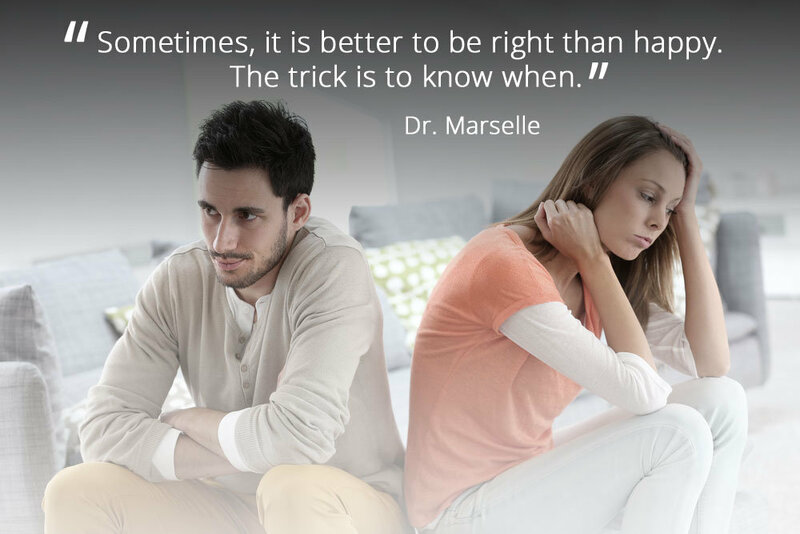 While this line of reasoning is a particular staple of couples therapy, it really applies to all forms of confrontational relationships. It’s a famous piece of advice – there’s even a song named after it – but experience tells us it’s not always so easy to implement in real life. If it was really that simple then you wouldn’t need to be told it in the first place. If you prefer A to B, then you choose A. If you keep choosing to be right rather than happy, perhaps that’s what you actually want. It’s easy to say you’d prefer to be happy, but your revealed preferences suggest otherwise. Perhaps it’s time to take a second look at this famous piece of wisdom. Let’s start by trying to think of a situation where it really is better to be right than happy. Actually, it’s not so hard. Imagine you were a general in an army and your superiors insisted on a strategy that you know will be disastrous. If you follow it, many of the troops whom your duty it is to protect will die. Worse, the entire war effort and your country’s security might be placed in danger. Is it better to take the easy route, to nod and smile, and walk away? Obviously, the right thing to do is to fight your corner and do everything you can to communicate your point of view. even at the cost of driving yourself to distraction. So, sometimes, it is actually better to be right than happy. The trick is to know when. The fate of a battle is important, but whether it was last Monday or Tuesday that you went shopping, is not. However, there is something more to it than that. If we look again at our example, we see that it’s not really being right that is at issue. Imagine you’re back at that military meeting. Your superiors decide on the plan that you know will result in failure. This time, though, instead of fighting it tooth and nail, you express your opposition politely and then give way. When the inevitable disaster happens, you arrive with a big smile on your face and announce, ‘I told you so!’. The difference between the two cases is not about being right. In both cases, you are right. In one case you want to convince others that you are right so you can make the world a better place; in the other, you want to convince others you are right so that you can feel superior to them. When you’re caught up with an argument, ask yourself why it’s important to you to convince the other person. Will demonstrating that you are right have a positive impact on anything you care about? Being concerned purely with being right will not lead you into arguments. If you truly want to be correct, then you will listen carefully to what others say to make sure you haven’t missed something. If you reflect and decide that you are correct and the other person is talking nonsense, fine. What we call ‘being right’ is not actually about possessing the truth, it’s about impressing your will on other people: making them declare you are right. So our famous question becomes slightly different, ‘would you rather be happy, or would you rather assert your power over those around you?’ If you are asking the question, you already know the answer. Sometimes, not all the time, but sometimes, what you want is to assert your power over others. Once you realize this is what is happening when you are trying to ‘be right’, you might notice it cropping up in other areas of life too. The question is, ‘why?’ Well, that’s what therapy is for. There are many reasons why you might feel the urge to assert your dominance over people around you. Only one on one interaction with a therapist can get to the root of the problem. Once you discover that problem, real effort and commitment are required to overcome it. After the process of healing and recovery, you’ll be in a position to choose to be happy because that’s what you truly want. Perhaps you are wondering which of the thousands of psychologists, counselors or therapists you should choose. Before you try to make a decision, ask yourself a more fundamental question: why do you need a psychologist at all? Psychology is not secret knowledge. If you want to learn about psychology from CBT to DBT, from Freud to Jung, then the information is out there. In the internet age, you don’t need even need to go to a library. If it’s someone to talk to you are after, then why do you need a professional? In truth, a therapist provides something valuable, even indispensable. However, it’s not what you might think. All of us have been through experiences that caused us pain. This is unavoidable. 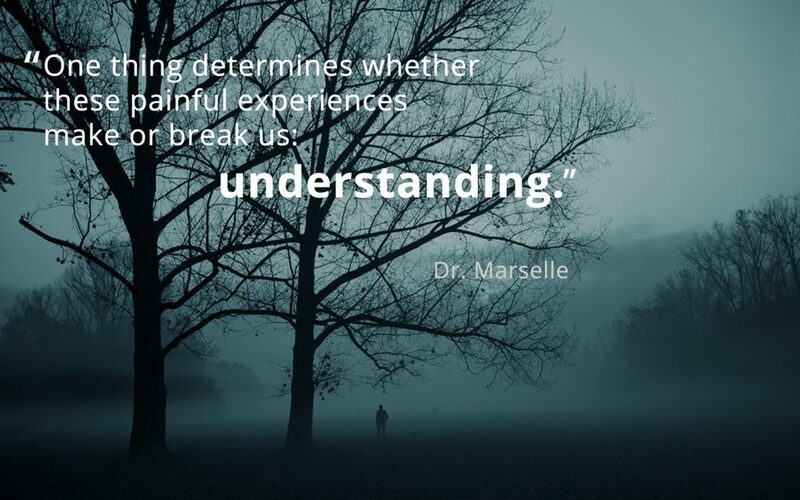 One thing determines whether these painful experiences make or break us: understanding. When we can understand our experiences, we can not only move on, we can learn from them and use them to grow. When we don’t understand, we cannot cope. An analogy with physical pain is useful. If you know that your finger hurts because it was burned, you do not find the pain disturbing. You know what to do to ease the pain and you even learn from it: be more careful around fire. However, if you have mystery pains, then you are unsettled, powerless. The only thing you can do is hope the pain goes way. Unexplained physical pain sometimes does just go away, but emotional pain doesn’t: it burrows underneath. Even if we realize that our buried pain is damaging us, we are unable to do anything about it because there is no way of dealing with pain that we do not understand. The role of the therapist is to facilitate the process of understanding your emotional pain. First, I can give you tools and techniques to moderate the pain when you first confront it. Secondly, I give you the opportunity to explore your experiences with a non-judgemental person. Of all the qualities required in a therapist, being non-judgemental is the most crucial, and the hardest to acquire. You will gradually learn to feel safe, and be able to explore your past without being crippled by humiliation or shame. Finally, I will give you the conceptual vocabulary to think about your feelings. Once you learn to understand the truth about yourself, you will be surprised by how quickly you can heal and become a better person. More Americans are seeing a therapist than ever before, and yet rates of unhappiness have never been higher. Perhaps it’s time for a different approach. Aristotle, who thought more about the meaning of happiness than perhaps anyone before or since, introduced an important distinction into philosophy: the difference between intermediate and final ends. Every time we do something it’s for a reason. When we get onto the bus, for example, it’s so we can get work. However, we’re not going to work for its own sake, but to earn money, and we don’t earn money for its own sake, but to by food, and we don’t buy food for its own sake but rather to be healthy, etc. When we look at it, we find that almost everything we do every day is done for an ‘intermediate’ end and the list of final ends, those that are valuable in and of themselves, is very small. One of them looms especially large: ‘happiness’. The irony is terrible. We spend most of our waking lives doing things that make us miserable, all in a fruitless struggle to feel happy. The key to finding happiness lies in another insight of Aristotle. To be truly happy we need to cultivate good relationships with other people. From my study of human nature, I would go further. In my opinion, Nothing in this world gives us meaning except the relationships that we have with other people. Only by forming and maintaining relationships will you attain happiness. No amount of money, success, or fame will get you there. What is more, with good relationships, you can achieve true happiness without them. However, that’s easier said than done. Not only are Americans unhappier than ever, they’re lonelier than ever too. (Of course, we know that one is causing the other). How can you form the relationships that you need to achieve true happiness? The answer lies in learning to control feelings of anger and resentment that have become deep rooted and habitual. If you have had negative experiences in your relationships, then these feelings will inevitably intrude into every relationship you try to form. Eventually, a vicious cycle develops. With each successive relationship that turns poisonous, you build up more negative relationship-destroying emotions that make the next time around even harder. The antidote for resentment is understanding. By reviewing past relationships, and understanding where the other party was coming from, you can gradually remove resentment from your heart. Then you can begin building new relationships freed from crippling emotional baggage. Ultimately, to find happiness we must approach ourselves as human beings, with a soul as well as a mind. Other therapists might approach you as a machine and look for the right knob to tweak to remove the sadness. 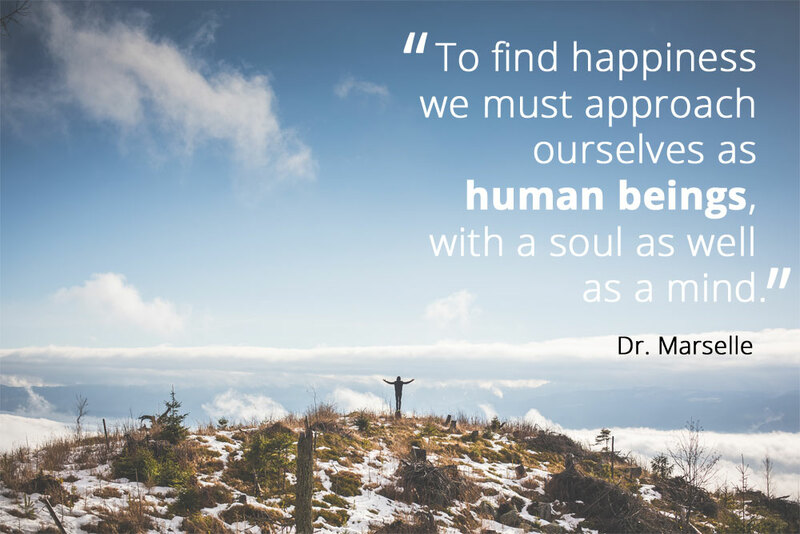 In therapy with me, we will work together to help you on the journey to true human happiness. Reach out today. Have you ever felt like you have been pushed up against a wall and there is no escape? Sometimes life takes an unexpected turn or the inevitable happens and you have to face the music, but you don’t have the resilience to deal with it. Our jobs or relationships can become frustrating and disappointing and there is no solution other than picking your poison. You saw the writing on the wall a long time ago. Someone crossed a line, but you felt the way you handled it was weak or questionable. You reevaluate the situation and anger forces you to take a harder look. After negotiating with yourself about momentarily feeling helpless and frustrated, you know something has to change. You go over it again and again until you realize you need to talk to someone about it. First, a few people come to mind immediately, but it’s too personal or embarrassing to talk to anyone about it. You reach deeper for that one person you can go to that will give good advice but going to them with the problem will reveal something about you or your life that isn’t worth the consequences. After all, we have a reputation to protect. We care about what other people will think. The risk of exposure isn’t worth the relief that might come and you remember that you rarely agree with solutions others give you anyway. You feel the wall at your back, and the frustration is worsening because the problem seems bigger as you fail with indecision. Seeing a therapist about it seems extreme but you have been preoccupied with your failing. Therapy, friends or clergy are out of the question because going to anyone and talking about it hurts and makes you angry. The days go by while the thoughts don’t. You have to see the scene where it all happened because it was in your home or job site. Or worse it occurred in public and you struggle with who saw what bothers you the most. The process of denial starts as you put together your public rendition of what is happening to you. People are starting to notice you aren’t yourself. You might have to say something, but what? You know the same circumstances could happen again because it’s impossible to avoid it. You must do something, but you take it on the chin. Maybe it’s easier just to act like it’s nothing. Perhaps you’re overreacting. What you do or don’t do is an action. The decisions you make and action you take will have consequences. 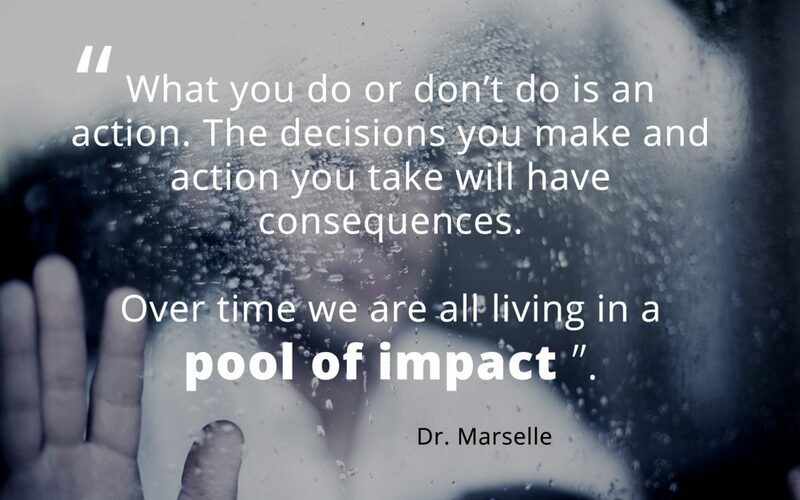 Over time we are all living in a pool of impact. Making choices is all about seeing your options. The way you think has gotten you where you are now. Your attitude and beliefs are a process that evolves with wisdom. I make it easier to chose your poison at TelepsyOnline. Seeing a psychologist who has a blog and online practice makes it easier to pick. Reading my blog will familiarize you with principles and purpose. You will find a solution that guarantees anonymity and confidentiality. Relief is just a click away. Online Therapy: attend therapy sessions from the comfort of your own home!